My rating: 8.5/10. Seiko 5 SRP777 watch, also known as the SRP777K1. Affordable automatic diving timepiece. Hello, today I’m doing a Seiko SRP777 review. 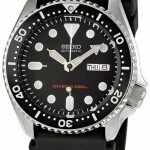 This is a popular Seiko diver that recently featured in our 25 best Seiko dive watches for men. The Seiko Turtle features this large interestingly shaped casing design that many people love the look of. It’s also diver’s 200m rated making it ideal for most diver’s needs. 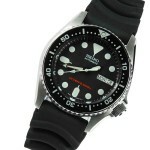 If you’re looking for the best affordable dive watch, the Seiko Turtle is a common choice. I hope you enjoy this Seiko SRP777 review below. This Seiko SRP777 is a very well known diving timepiece. It features this high visibility display with bold hour markers and hands that are coated in lume for excellent visibility in dim lit conditions. The bezel is black in colour and can be rotated unidirectionally. It has minute numbering on the bezel. The Seiko Turtle features a Hardlex crystal glass to protect the dial. This type of glass is known to be tougher than mineral crystal glass and offers you a pretty good amount of scratch and knock resistance. Powering the Seiko Turtle is a 24 jewel automatic Seiko 4R36 movement. This movement has a 41 hour power reserve and features both manual winding and hacking. It beats at 21,600 BPH give it a really smooth 6 ticks per second movement. This Seiko diver has a 44mm casing diameter (not including the crown). The thickness is rather chunky at 14mm too. The Seiko Turtle is known for its large profile. The strap of this model is made of a robust rubber and has a width of 22mm. The band can be replaced if you wish to do so. The strap fastens with a standard buckle style clasp. This Seiko watch has a diver’s 200m water resistance rating which is the very good to see. 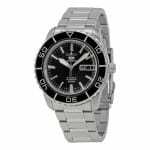 A Diver’s 200m or 20 bar rating makes this watch suitable for scuba diving at depths not suitable for saturation diving. Band: Stainless steel strap, standard length, 22mm width, fold over style clasp. Case: Stainless steel casing, sizing diameter: 44mm and thickness: 14mm. Water Resistant: A water resistance of up to diver’s 200m / 20 bar. 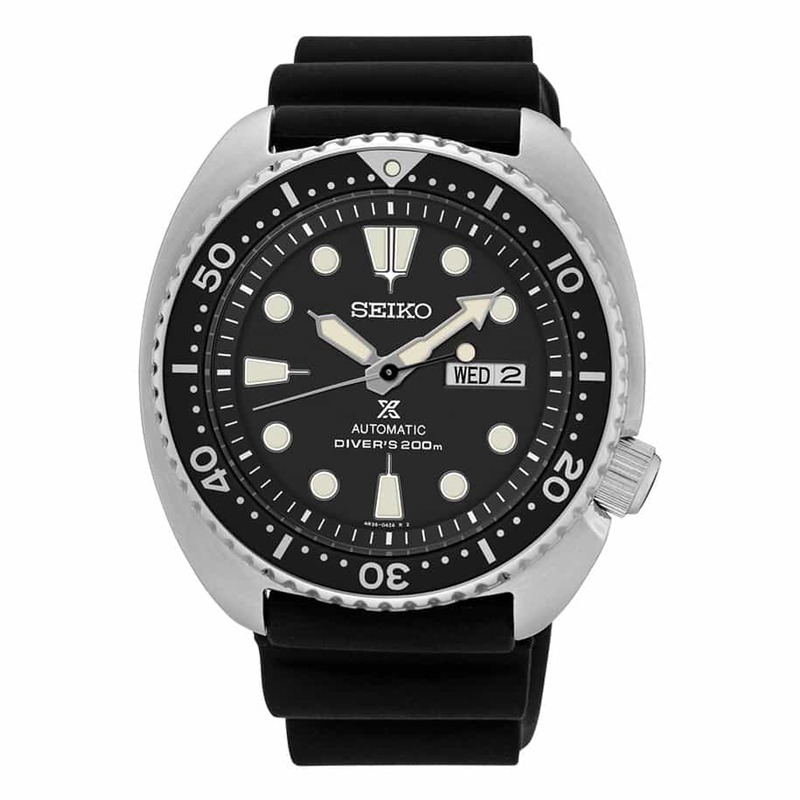 The Seiko Turtle is an extremely popular diving watch with quite a big following. The watch features an excellent diver’s 200m rating as well as a reliable and accurate automatic movement. I like to stick to listing retailers that I’ve actually had experience buying from in the past. Below I’ve listed some of the top places to buy this watch from, check all for the best price. Variations of this watch include: Seiko SRP777, Seiko SRP777K1. Hope you enjoyed this Seiko SRP777 review. Why not read my Steinhart watches review next.